East Collingwood Council extended its major streets northwards to take advantage of the country trade from the Heidelberg area and provide access to the Melbourne Corporation basalt quarries in Clifton Hill for building stone. The oldest remaining buildings in the Clifton Hill East Heritage Overlay Area include the pre-1853 bluestone houses at 27 and 29 Clifton Avenue, 2 Ford Street and 3 Horne Street, built by quarry owners. The quarries, located along and west of the Merri Creek near the end of Ramsden and Noone Streets, were long-term fixtures of the area, with the Melbourne City Council quarry in Wright Street (31) closing in 1939 and the Collingwood Council quarry in 1963. Unlike Fitzroy, Richmond and Collingwood, Clifton Hill was laid by the Colonial Government, rather than as an accumulation of localised private developments. Distinguished naturalist and engineer, Clement Hodgkinson, as Victorian Assistant-Commissioner of Crown Lands and Survey 1861-74, was responsible for the government subdivisions of Carlton (south of Princes St, 1860), North Carlton, North Fitzroy and Clifton Hill (1865-9), Hotham Hill (1866), South and North Parkville (1868-9). Under his supervision, suburban planning employed the cost-efficient grid system used by Hoddle, Hodgkinson's predecessor. A c1864 survey plan by government surveyor for the Melbourne district, Thomas Samuel Parrott (32), shows the area south of Roseneath Street divided into 50 or 60 foot frontage allotments. The land north of Roseneath Street had also been sold and was fenced. In contrast to the generous provision of the Darling Gardens and other reserves in West Clifton Hill, East Clifton Hill allotments were all sold between 1871 and 1874 with no provision for public or ecclesiastical reserves. This was probably a result of the continuing quarry activity and night soil deposits in the area, being no place for mainstream residential development when surveyed. A plan by government surveyor Michael Callanan and titled `Allotments in the Boroughs of Brunswick, Fitzroy and East Collingwood' showed suburban allotments (most sold in 1871) set within the radial arms of Ramsden and Spensley Streets. These streets emanated from the railway station site in John Street and terminated on the Esplanade and the old Manure Depot (c1861-, now parklands next to the Merri Creek). The Melbourne Quarry Site adjoined the Depot in Wright Street, and, to the west of the quarry, an `old road' meandered from the Heidelberg Road, south along the Merri Creek, towards the Municipal Abattoirs, sited south of the east end of Ramsden St (33). In 1888 the Royal Park Junction to Clifton Hill Railway (the Inner Circle), along with the Clifton Hill station in John Street, was opened. In 1901, the railway circle was completed with the extension south from Clifton Hill through Collingwood and Richmond to Princes Bridge Station, boosting residential development in the area. Old quarry holes were progressively filled up from the 1880s and all of the streets had been laid out with most of the development being concentrated towards the western and northern sections of the precinct, near to transport routes such as the railway, Hoddle Street and Heidelberg Road. Larger quarry reserves and creek-side areas, such as the Manure Depot off the Esplanade, were eventually redeveloped as parkland reserves, each providing a marker of the former history of the area and a vehicle for mature landscape development that enhances the adjoining urban character (34). Street trees however are not typically shown on MMBW Detail Plans from c1900. As with Clifton Hill West, industrial complexes with impressive Edwardian and Victorian-era brick factory buildings continued to be located in the south of the area fronting Alexandra Parade and Hoddle Street, and adjacent to the former Reilly Street drain that was essential for effluent disposal. These complexes are significant markers of the area's industrial past, including Schotts Emporium (the former Clifton Shoe Company) Hoddle Street, Pitman Shoe Company in Groom St, the Stockport Hat Mills and the Puttifoot and Bloom shoe factory in Noone Street, the Commonwealth Harness Saddlery and Leather Accoutrements Factory and the Trueform Shoe Company Pty. Ltd. In Roseneath Street as important landmarks in the area. This collection of factory buildings reflects the intense industrial activity in the area, particularly the boot and shoe and clothing industries, from c1900. 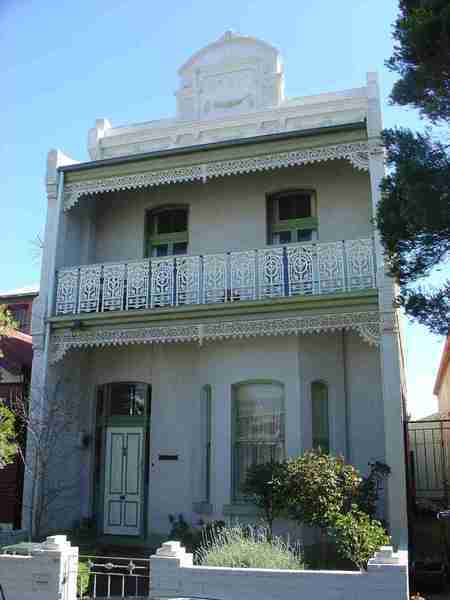 The main development period evident in the Clifton Hill East Heritage Overlay Area is that of the Victorian and Edwardian-period, with a contribution from some well preserved inter-war buildings and inter-war building groups, and individually significant places of all eras.
. Front gardens, originally bordered by typically timber picket front fences of around 1m height.
. Quarry faces and sites. The Clifton Hill Eastern Heritage Overlay Area is significant.
. For the special urban landscape character (particularly that of The Esplanade) enhanced by the large areas of adjoining creek-side parkland, many of which were developed on former quarry sites. 29 B Barrett, The Inner Suburbs, pp. 9-10. 30 B Barrett, The Civic Frontier, p. 156.